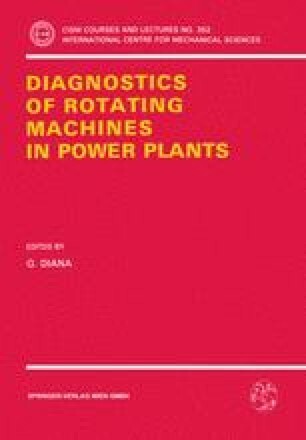 The paper shortly describes the diagnostic methods and points out the relevant activities that in the most recent time have been carried out systematically and in particular those activities related to an extensive program for the vibration signature (base line) of turbine generator sets. For the purpose the machines design was modified in order to install new transducers and improvements was achieved in developing mathematical models, data processing software, acquisition systems, including mobile laboratories. Advanced diagnostic oriented vibration monitoring systems (SMAV) have been specified by ENEL and two prototypes will be installed at the end of this year on turbo generator sets. The main characteristics of “SMAV” are described and some indication of the future development of such systems are also mentioned; these development are mainly related to special alarm logic and data reduction for an easy information recovery. The strategies that were developed for steam turbine plants and that caused the above mentioned actions are being to be adapted and applied to turbogas plants.